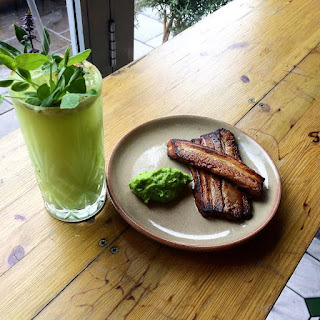 Chefs Boustead & Bidois, who previously popped up in Highbury & Islington, have taken a trip donw the Victoria Line to their new residency at Shrub & Shutter in Brixton. Food is modern British, so expect dishes like Asparagus, Anchovy Crumb & Hen's Egg, and Spring Lamb Leg Steak, Carrot Puree, & Grilled Spring Onions. I never got to try their food up in N1, so I'm delighted they've popped p again. "Pop up Chef duo Boustead & Bidois have created a new menu for their residency at The Shrub & Shutter. The team consists of friends Chris Boustead and Tomas Bidois who met whilst working in London. With residencies at the Opera Tavern and Pitt Cue under their belt, we're very excited that they’ve finally come to Brixton. Expect modern British dishes using seasonal produce, with Shrub style cocktails to match the dishes."